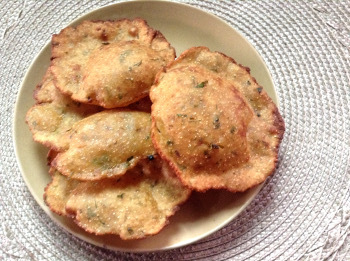 Masala poori / tikhat mithachi puri is tasty, spicy poori, a spicy Indian fry bread recipe. Tikhat=chili powder and mith=salt. Masala, in Indian language means spice mixture. Masala puri is a good breakfast or a filling snack recipe. You may also serve it for lunch or dinner or take it to school or office for lunch. It is also a good picnic or party dish. The preparation and cooking is similar to Poori. A spice mixture is added to the whole wheat flour to make the dough. And what a difference that makes in the taste and color too. Just try it and see for yourself. You can use your favorite spice mix or the one given in the recipe below. You can make the dough and keep it in the fridge for 3-4 days and make pooris within a few minutes whenever you want. 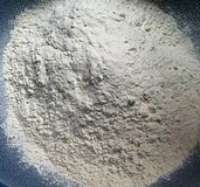 Atta / Whole wheat flour - 2 cups. Add water little by little and form a tight dough ball. Heat oil in a deep frying pan. It should be on medium hot once it is heated well. Put the round carefully in the hot oil. It will puff up. Turn on to the other side. Let cook for 5 seconds. Take out the poori and drain well. Masala puri can also be eaten by itself. It is a perfect item to take it for lunch to office or school or for a picnic. It will be good to eat for a day. Even if you are watching your fat intake, it is OK to eat poori once in a while. You should not miss out of good tasty items. Don't you agree? Ajwain (carom seeds or Bishop's weed) is good for digestion. I love the taste too. You can eat a pinch of ajwain seeds after food to help digestion. Indian Bread Recipes - List of a Variety of Indian flat breads. 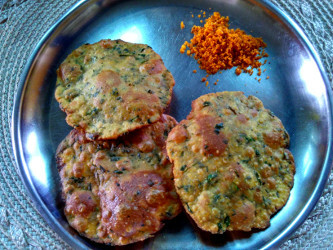 Thalipeet - jowar flour - Sorghum flatbread. Palak Poori -Poori with nutritious spinach.